Unwind in the beautiful islands of the Seychelles. Explore the palm-lined beaches of Praslin, hike along forest trails on Mahe and cycle around the paradise island of La Digue. Get off the beaten path in this iconic destination and discover a different side to these tropical islands. We can arrive at any time today and take a short transfer to our accommodation located on the beautiful Beau Vallon Beach, the largest in Mahe. This evening the beach hosts its weekly night market. A short walk from our hotel it provides a great opportunity to sample creole street food and browse the handicraft stalls. Supper tonight can be a picnic on the beach and is a perfect introduction to the delicious seafood barbecues and coconut laced curries you will come to enjoy over the next two weeks. Combined with a magnificent Indian Ocean sunset what better way to start your holiday? We spend this morning exploring Mahe's capital, Victoria, on foot. Whilst it may be more of a capital town than a capital city, Victoria is definitely worth a visit. Independence Avenue, the modern shopping area, is as charming and full of life as the old colonial quarter. The heart of the city is around the cathedral and famous clock tower, which is a perfect (smaller) replica of London's Big Ben. We include a visit to the market with its abundance of colourful fruit, vegetables and freshly caught fish before continuing on to the tranquil Botanical Gardens. Here we see the famous coco de mer nut, giant tortoises and a collection of rare exotic plants. Colonies of fruit bats roost overhead and regularly take flight across the giant palms. We return to our hotel around lunch time and this afternoon is free to enjoy the facilities and simply relax. The Seychelles beaches are incredibly clean and free from litter, they are also all open to the public so there are no beaches off limits - you can lay your towel wherever you choose. Mahe is the Seychelles largest island and is the political and economic centre. Some 27km long and 8km wide, it has beautiful beaches with powder white sand, graceful palms and clear turquoise waters. The incredible diversity of the islands' scenery and vegetation is due in part to its mountainous interior which reaches a height of 905m. Roads on Mahe are well maintained and provide good access to the many hidden coves and villages. Today we take a trip which takes in all of the island's highlights. Travelling by bus and on foot we follow the short Glacis Trois Freres Trail, passing through lush rainforest and a tea plantation, ending at the factory where you may take a short guided tour or simply sit with a brew and take in the magnificent Indian Ocean views. We will also visit the Mission, a place of historic importance after the slave trade. Arriving at Baie Ternay Beach around lunch time there will be opportunities for swimming and snorkelling before taking a stunning coastal drive right around the southern peninsula, stopping to take photographs and admiring the incredible scenery and vivid island colours. An optional full day boat trip is available today for those who want to take to the water and explore other islands and the wonderful marine life. The boat is glass bottomed and sails from Victoria to the St Anne Marine National Park, a cluster of islands off the north east coast. The calm crystal waters are perfect for snorkelling and sightings of turtles are very common. We land on one of the protected reserves and say hello to the giant tortoises who reside here. We enjoy a barbecue lunch before taking to the waters once more, swimming as we anchor alongside a beautiful beach. For those who do not participate in this activity our hotel has a lovely pool and access straight on to the beach. On many of the Seychelles beaches it is possible to wade out and snorkel straight from the shore line, this in part is due to the enormous granite boulders which dramatically rise out of the sea and appear to book mark the ends of each beach. These imposing rocks shelter the waters, and are what differentiate the Seychelles beaches from those found elsewhere in the Indian Ocean. This morning we leave Mahe and take the one hour crossing to Baie Saint Anne, Praslin, the second largest island in the Seychelles archipelago. Keep a look out for dolphins on the journey as they are regularly spotted in these waters. Praslin is home to one of the Seychelles World Heritage Sites - the Vallee de Mai. It is a primeval rainforest containing the famous coco de mer palms that have the largest and heaviest coconuts in the world. Vanilla orchids, a variety of lizards, frogs and some of Earth's rarest birds also reside here. The walk follows a designated pathway and is shaded almost throughout as the trees provide an enormous rainforest canopy offering a welcome relief from the hot sun. Our entrance ticket is valid all day so we can spend as long as we wish here before taking the simple downhill walk back to our hotel. This evening there are several restaurants close by to try out, plus there are also take away options. Whilst seafood and aromatic curries may dominate the menus in this part of the world, there is plenty of choice with pizzerias and Italian restaurants popular too. Praslin is an ideal place from which to take a boat trip and explore other islands in this vast archipelago. Departing after breakfast we take a full day boat trip which visits the island of Curieuse and anchors at the snorkelling spot, St Pierre. Disembarking at Curieuse we are greeted by giant tortoises who amble freely, close to the waterfront. An hours' walk through the interior takes us across boardwalks above the mangrove swamps. Hundreds of mud crabs scuttle into their holes as we approach. As we get close to the water's edge listen out for splashing; small sharks and rays are often sighted here. The conditions may be hot and humid but the majority of the walk is flat and in shade. A delicious barbecue lunch is served back on board before continuing to St Pierre Island, a pristine snorkelling area with colourful fish and the occasional turtle. We arrive back at our hotel around tea time so can freshen up before venturing out later for supper. Just a few yards from our hotel we catch the public bus this morning to the start of our walk. After disembarking we descend slowly along pathways, taking our time as we stop to look at the endemic fauna , listen out for birdlife and take in the stunning panoramic views. We cross to the other side of the island and arrive at our first beach and swim and snorkel before continuing on towards the headland. The scenery is magnificent as we look out across the ocean and other islands. Anse Lasio is our final destination, arguably the most beautiful beach in Praslin. Here we spend some time enjoying the crystal clear waters and soft white sand. Again we swim and snorkel enjoying the marine life right from the shore. After our full day of exploration we take the local bus back to our hotel which follows either a coastal or mountainous route depending on the timetable running that day. We depart Praslin and take a short fifteen minute ferry journey to laid back La Digue. This island is the smallest of the three on our itinerary and is the epitome of idyllic isolation. It has a real traditional charm about it with plantation houses and dusty roads. Arriving here is like stepping back in time. Transport is very closely controlled on La Digue and the most popular form of travel is by bicycle. The beaches are simply breathtaking; it is a pure photographers dream. This afternoon we take to our bikes and cycle along the top of the island. La Digue is geared up for cycling offering smooth paths which run parallel to the beach and virtually no traffic. The water is so clear marine life may even be spotted from your saddle. There is ample time to stop wherever you choose, enjoy the incredible scenery and maybe spot a giant tortoise seeking shade under a tree. We return to our characterful hotel in time for supper. Our property is a stunning former chateau, with villa style accommodation dotted around the gardens and swimming pool. After breakfast we will take a walking tour to L'Union Estate, a working coconut plantation. We will be taken through the whole process from the coconut dropping from the tree to producing coconut milk and oil. The plantation sits in a lovely garden setting and the buildings offer great examples of Creole architecture. It is also located close to a succession of stunning beaches. The rest of the day is left free to enjoy this island paradise. You may like to drop by the local ice cream parlour to enjoy a refreshing drink and sample the tropical flavours. Today we explore three of the most stunning beaches found on the island. These are off the beaten track and so we will enjoy these shores almost to ourselves. The start of the walk takes us past La Digue Vev Reserve. This is home to the paradise flycatcher, a bird endemic to La Digue which has quite remarkable colouring. The male is a blackbird with a bright blue bill and blue around its eyes; it appears to be wearing bright blue sunglasses! We then continue towards the beach and after half an hour or so will reach our first beach of the day, Grand Anse. We are greeted by an enormous expanse of white sand, turquoise water and huge boulders jutting from the sea. After a refreshing drink we continue further to the second beach, Petit Anse. This walk takes a rocky path, shaded in places, providing glimpses through the vegetation of the incredible blue sea and white sand below. Our third and final beach, Anse Coco, is worth the effort of a further thirty minute walk. This beach not only has the powder sand and crystal waters of the others, it also has a hidden gem - a large secluded rock pool hidden behind a cluster of enormous boulders. It provides the most perfect swimming spot. The afternoon is quite flexible with the option to stay at the beaches as long as you wish, relaxing, snorkelling and just taking in this incredible paradise. We'll take a slightly different route back to the hotel at the end of the day which is approximately one hour of gentle walking. We return to Mahe Island by ferry and enjoy our last day in the Seychelles. Passengers with flights booked directly through Explore have access to our hotel until departure for the airport. So there will be a last chance to enjoy some pool and beach time before heading home. Land Only passengers who have booked their own flights will end the trip on arrival in Mahe late morning. 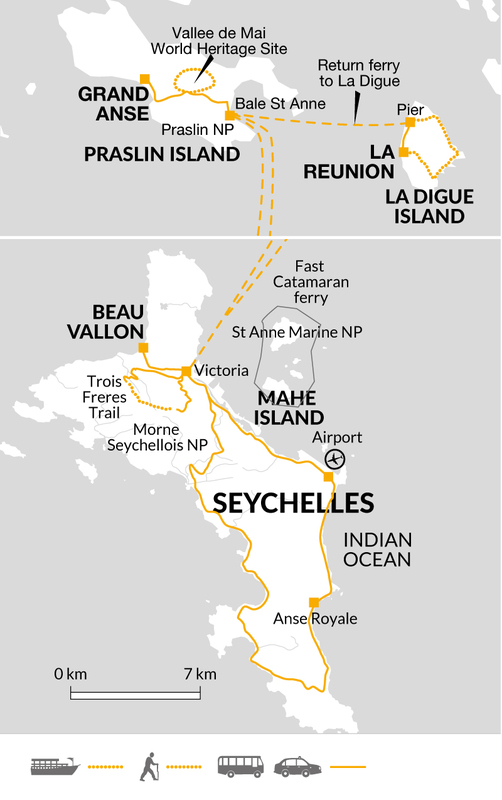 The location of the Seychelles, almost directly on the equator, ensures the islands of the Mahé group have a relatively constant climate. Average daytime temperatures range from 24 to 30°C. Relative humidity hovers around 80%. Seasonal winds provide not only refreshment, but also a certain amount of climatic variation. The 'cooler' dry season between May and October is a result of the southeast trade wind. From December until mid-March the northwest monsoon is responsible for warmer, wetter weather. Between these two distinct seasons the islands experience intense heat occasionally aggravated by a complete absence of wind. Mahé Island -Tea factory tour €2.00 per person; Glass bottom boat trip (including lunch and snorkelling) €105.00 per person. La Digue Island - Bicycle hire €10.00 per person per day. Lightweight walking bootshoes or trainers are useful for exploring the islands. Sandals for relaxing and beachwear. One main bag - either a holdall, soft bag or suitcase, plus a daypack. Please remember that you will have to carry your luggage on and off ferries, so try not to overload yourself. Take a small torch, water bottle, sunglasses, sunhat, suncream, insect repellent, binoculars if planning to birdwatch and a beach towel. Snorkelling opportunities are endless so we strongly recommend you bring your own mask and fins. Bring a lightweight rainjacket just in case. Accordingly, you should allow €20.00 per person for group tipping. We suggest you take most of your spending money in cash (in small denominations). Sterling, Euros and US Dollars are all readily convertible. N.B. US$ notes should be in good condition and not torn or marked. Notes prior to 2000 of any currency are often not accepted. There are ATMs, which accept major international cards, at the airport and at all the major banks in Victoria. You\ ll also find ATMs at Beau Vallon on Mahé and on Praslin and La Digue. Widely accepted, but the government does impose a levy which is passed on by the retailer, so check first. We stay in three locally-owned and run guest house/hotels in the Seychelles, which brings money into the hands of local people. Seychelles: Most nationalities including citizens of the UK, EU, Australia, New Zealand, US and Canada do not require a visa. However, you will need to provide a valid flight ticket, have confirmed accommodation and have sufficient funds for the intended length of stay. Permit will be issued on arrival valid for 1 month. Nothing compulsory, but we recommend protection against tetanus, typhoid, hepatitis A, polio and diphtheria. A yellow fever certificate is required if you have travelled from or via a country where yellow fever is endemic. Please check the latest requirements with your travel clinic or doctor prior to departure. The above is not an exhaustive list. Further information regarding vaccinations and travel health advice can be found by following the NHS and NaTHNaC links at Explore Travel Health and from your local healthcare provider. Visa and vaccination requirements are subject to change and should be confirmed by you before travelling. Explore staff in the Seychelles! Product Executive Caroline and Customer Sales Executive Mandy had the enviable task of travelling to the Seychelles to recce the islands and find out what they have to offer. Read their blog to find out how they got on.